Available in soft wood tones or a variety of whites and colours. Provide great privacy and excellent noise reduction. Can be opened right back against your inner wall. Luxurious but also practical, our timber Plantation Shutters are available in a huge range of colours and styles, and also have superb sound and insulation properties. These shutters are a beautiful, custom-made window treatment that will enhance the appearance and value of your home. We also offer significant savings on price compared to our competitors – with options to suit every budget between our five ranges. Plantation Shutters (also commonly referred to as Window Shutters, Internal Shutters or even Shutter Blinds) are a very popular window treatment with those who wish to add a touch of luxury and elegance to their home. 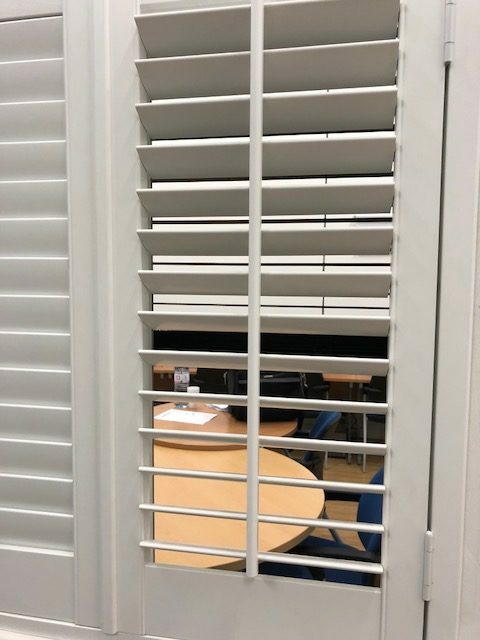 These wooden shutters also give great flexibility in terms of ventilation, light, sound deadening and privacy due to their louvred slats. At First Choice Blinds we offer plantation shutters at incredibly competitive prices. Plantation shutters provide the homeowner with a beautiful window covering that can become a key feature in a room or an aesthetically pleasing feature, the choice is yours. Plantation shutters provide the homeowner with the ability to control the level of light entering a room to an exacting amount, perfect for setting the mood and tone of your room. A fantastic element of plantation shutters is that while you may want privacy in your room, you will still want natural light to enter. Shutters are unique in that they can be individually set to accommodate for natural light while still providing privacy and security. CAN SHUTTERS WORK WITH CURTAINS? Of course! Curtains are very attractive and eye-catching feature of a room, providing total window coverage and great insulation. There is no reason plantation shutters & curtains cannot go hand-in-hand. Not only do they look wonderful together, but perform fantastically together too! You can have total control over the light in a room, you can also ensure you are getting maximum insulation by the combined effects of the blinds and the shutters. Visually, shutters and curtains look stunning. See for yourself in our gallery for more! ARE THESE SHUTTERS TAILOR-MADE FOR ME? Absolutely! All of our shutters are made to measure, and are done to your windows / doors exacting requirements. You can choose how you want your plantation shutters to look and the dimensions of the wood used during construction. 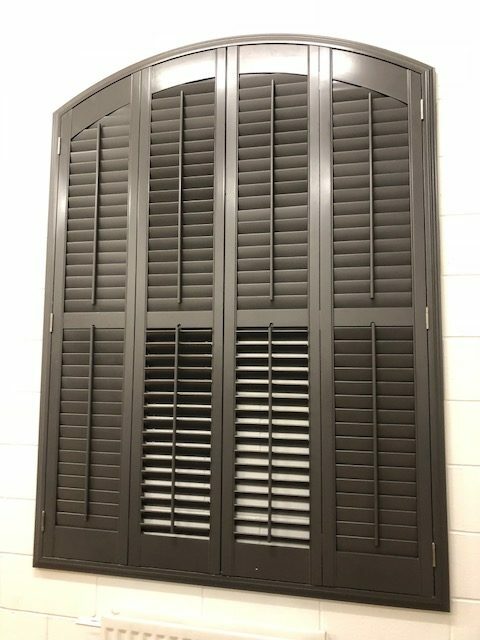 WHAT TYPE OF SHUTTERS CAN I CHOOSE FROM? In terms of style, the sky is the limit. When we make a shutter, we make it for one customer and one customer only. Every shutter we supply is personal, meaning your shutters are tailored and individual. The type of shutter you request for your window or door is likely to be exclusive, and specific to your personal expression and taste. There are so many levels of customisation available to you, including colour, shape, style and accessories for the shutters. So we believe there is just one type of shutter we provide, and that is your type – made to your exacting requirements. WHAT ARE YOUR SHUTTERS MADE FROM? By default, we sell hardwood (basswood) shutters, which is universally recognised as the premium material for shutter construction. But you do have options. We offer a range of materials to cater for any situation or requirement. We can supply Shutters in a range of materials and timbers, including Cedar, MDF & our specially formulated ABS waterproof material. All of our interior plantation shutters are available in a full range of Sayerlack Paints, an industry leading provider of wood paints. Our painters ensure your plantation shutters are of the highest quality and none make it through our manufacturing floor without proper inspection. Our customer favourites are cream, white and off-white, with custom paints available for order. ARE THESE SHUTTERS SAFE FOR CHILDREN? Of course. All of our shutters are provided with complimentary magnets which secure our plantation shutters to the window/wall and will require more that a child’s effort to detach the magnet. Furthermore, windows can be left open, with the shutter providing a guard for small children around the open window. HOW MUCH INSULATION DO PLANTATION SHUTTERS PROVIDE? Plantation shutters provide excellent insulation. As can be seen from our thermal scans of a home with and without interior shutters, the level of insulation provided is instantly apparent. 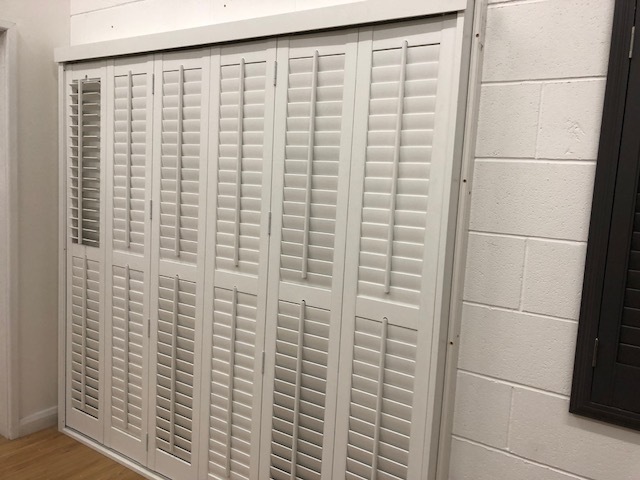 Another great feature about interior shutters is that on a hot day, the shutters can allow cool air to enter a room without the glare of the sun entering the room and heating a room to an uncomfortable temperature.